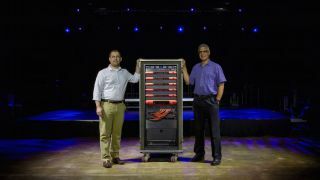 Vince Lepore and Mark Johnson, pictured with an equipment rack featuring Focusrite RedNet components. Full Sail University in Winter Park, FL has installed a comprehensive system of Focusrite RedNet Dante-networked audio converters and interfaces in its Full Sail Live 1 building, which is home to the university’s Show Production Bachelor of Science degree program. Incorporating RedNet MP8R eight-channel Mic Pre and A/D converters, RedNet D64R 64-Channel MADI-Dante Bridges, RedNet HD32R Pro Tools | HD/HDX Bridges, and RedNet 2 16-channel remote-controlled analog interfaces, the new Focusrite system not only provides networking throughout the facility, but also offers students practical experience with the Dante Audio-over-IP protocol. Full Sail Live 1 encompasses a large production space and a variety of ancillary show production-related rooms in a facility where students learn about sound reinforcement, lighting, live video and multimedia, automated lighting, concert touring, and audio measurement systems. “We were looking for a solution to connect all those different rooms together over IP. RedNet was that solution for us,” said Vince Lepore, course director of the Show Production Systems course at Full Sail University. The RedNet system allows diverse live audio production equipment from a variety of manufacturers to interoperate on the Dante network, including Yamaha CL5, DiGiCo SD7, SD8, and SD9, and Avid Profile mixing consoles, Lepore said. “We also have a Calrec Summa console that has a Hydra 2 I/O box with a Dante card installed, so that’s on the network as well. And we have Lab.gruppen LM44 and BSS Audio Soundweb London BLU-806 loudspeaker processing on the network,” which in turn feed loudspeaker systems by Dynacord, Meyer, JBL or L-Acoustics, he said. An equipment rack featuring Focusrite RedNet components, recently employed at Full Sail University. In that same rack is a RedNet 2, which enables audio to be returned to the stage from any console or other audio device on the Dante network. Three RedNet D64R interfaces are in place to convert Dante audio channels to MADI for input into the DiGiCo consoles. “We also have three RedNet HD32Rs, which connect our Pro Tools systems to the network,” Lepore said. “We can now record from anywhere on the network and we can play back to anywhere on the network from any of our Pro Tools systems. That’s really given us a lot more flexibility to our Pro Tools workflow. “We have a RedNet 2 unit in our video control room that takes sources from the video control room, such as playback feeds, and puts them onto the network. They are then available to all the different consoles throughout the building.